Later today, you'll be full of turkey and bored with talking to your family. Fact. So why not settle down with a nice story? 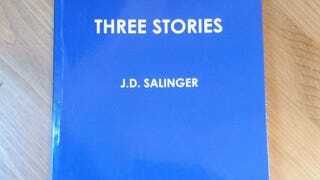 In fact, how about these three unpublished works by JD Salinger, that have just been leaked online? After showing up on an eBay auction, the trio of stories—The Ocean Full of Bowling Balls, Birthday Boy and Paula—was uploaded as a PDF. It seems to have been scanned from an unauthorized book called, aptly enough, Three Stories. While it seems to have an ISBN number and barcode, neither lead anywhere.